Getting Lean with Ad Tech | adaptifyed™ The Adaptifyed system for monetizing downloadable files is covered by U.S. patents: US9451011B2, US14318109, US15243350, and pending application: US20150007256A1. The following article by Scott Cunningham of the IAB (Internet Advertising Bureau) takes a look at the mistake the online publishing industry has made by overloading sites with advertisements. Have we messed up to the point that it’s unfixable? I suppose time will tell. Adaptifyed it working to reduce some of the ad noise on websites. Perhaps if we create less ads with more relevance, balance can be restored. This was choice—powered by digital advertising—and premised on user experience. Through our pursuit of further automation and maximization of margins during the industrial age of media technology, we built advertising technology to optimize publishers’ yield of marketing budgets that had eroded after the last recession. Looking back now, our scraping of dimes may have cost us dollars in consumer loyalty. The fast, scalable systems of targeting users with ever-heftier advertisements have slowed down the public internet and drained more than a few batteries. We were so clever and so good at it that we over-engineered the capabilities of the plumbing laid down by, well, ourselves. This steamrolled the users, depleted their devices, and tried their patience. The rise of ad blocking poses a threat to the internet and could potentially drive users to an enclosed platform world dominated by a few companies. We have let the fine equilibrium of content, commerce, and technology get out of balance in the open web. We had, and still do have, a responsibility to educate the business side, and in some cases to push back. We lost sight of our social and ethical responsibility to provide a safe, usable experience for anyone and everyone wanting to consume the content of their choice. We need to bring that back into alignment, starting right now. Today, the IAB Tech Lab is launching the LEAN Ads program. 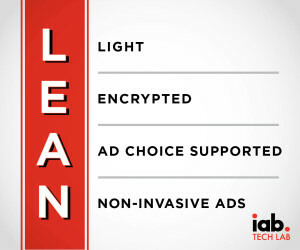 Supported by the Executive Committee of the IAB Tech Lab Board, IABs around the world, and hundreds of member companies, LEAN stands for Light, Encrypted, Ad choice supported, Non-invasive ads. These are principles that will help guide the next phases of advertising technical standards for the global digital advertising supply chain. As with any other industry, standards should be created by non-profit standards-setting bodies, with many diverse voices providing input. We will invite all parties for public comment, and make sure consumer interest groups have the opportunity to provide input. LEAN Ads do not replace the current advertising standards many consumers still enjoy and engage with while consuming content on our sites across all IP enabled devices. Rather, these principles will guide an alternative set of standards that provide choice for marketers, content providers, and consumers. Among the many areas of concentration, we must also address frequency capping on retargeting in Ad Tech and make sure a user is targeted appropriately before, but never AFTER they make a purchase. If we are so good at reach and scale, we can be just as good, if not better, at moderation. Additionally, we must address volume of ads per page as well as continue on the path to viewability. The dependencies here are critical to an optimized user experience. The consumer is demanding these actions, challenging us to do better, and we must respond. The IAB Tech Lab will continue to provide the tools for publishers in the digital supply chain to have a dialogue with users about their choices so that content providers can generate revenue while creating value. Publishers should have the opportunity to provide rich advertising experiences, LEAN advertising experiences, and subscription services. Or publishers can simply deny their service to users who choose to keep on blocking ads. That is all part of elasticity of consumer tolerance and choice. Finally, we must do this in an increasingly fragmented market, across screens. We must do this in environments where entire sites are blocked, purposefully or not. Yes, it is disappointing that our development efforts will have to manage with multiple frameworks while we work to supply the economic engine to sustain an open internet. However, our goal is still to provide diverse content and voices to as many connected users as possible around the world. IAB Tech Lab Members can join the IAB Tech Lab Ad Blocking Working Group, please email adblocking@iab.com for more information. Read more about ad blocking here. The Adaptifyed system for monetizing downloadable files is covered by U.S. patents: US9451011B2, US14318109, US15243350, and pending application: US20150007256A1.